The weather seems to be cooperating for the 115th Boston Marathon scheduled for this upcoming April 18th. Though spring has been with us for a bit the Patriot’s Day holiday kicks off the spring season particularly since it is the beginning of school vacation. We wanted to update the post from last year since some links have changed, particularly for the spectator’s guide which now seems to be covered online under spectator information. Last year my family and I got to see some of the action next to Boston College as the runners are coming down from heartbreak hill. I was able to film some of it which I will post soon. For visitors, spectators and runners this is a great opportunity to enjoy the many sights, attractions and restaurants in and around Boston. The Boston Athletic Association has a page with links to the main Boston tourism sites. Enjoy the Race! 2010 post: The 114th Boston Marathon‘s economic contribution is expected to be in the $110 million range this year. This according to the John Hancock press release earlier this year. 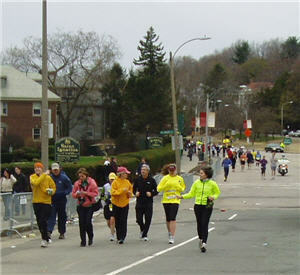 Whether you are a running fan or not you can’t help to feel the buzz of Marathon day in the Greater Boston area. If you are driving anywhere along the 26 mile route expect detours. You are better off just parking somewhere and joining in the festivities. The Boston Marathon attracts people from around the world. Running fans as well as runner supporters line the route. This year you can also opt for TV coverage from the official media partner WBZ4. They will have local coverage and you can also checkout www.universalsports.com for online coverage. The are owned by NBC. The Boston Marathon impacts the economy in a variety of ways from the booking of hotel rooms to the various restaurants and retails shops along the route. Sporting good stores of course benefit from the marathon mindset. How many of us, runner or not, checks out the running shoes during the Boston Marathon “Season”? How many of us go and replace our running shoes? How many of us start running? There are much advice out there on where is the best spot to see the marathon. I won’t give specific advice because it all depends on what you want to see. Do you want to see the struggle and triumph of Heartbreak Hill in Newton or do you want to see the runners as they cross the finish line? Of course, the toughest spots will be at the finish line at Copley. We have had people running the Marathon before and invariably you have to pick a meeting spot, like one of the restaurants, hotels or bars in the area( I think we met up at the Lenox). The runner should also give you an estimate of how long they think they will run. This will give you a good time to be at the finish line(if you can muscle your way in the crowd). Many folks just opt to take in the race at restaurants and pubs along the way, Cleveland Circle is a good example of that. The Boston Athletic Association has come up with their own guide though. You can download the 2010 Spectator Guide at their website. This guide is more for where to view the race. I found About.com’s article on Best Places to Watch interesting as well. I found a video that brings you through the course in fast time mode. I thought it was kind of neat. I wonder if one could be done from a runner’s perspective?